The Midlands Gateway Chamber serves as the representative lobby group that supports issues and projects that are critical to enhancing business growth in the Midlands region. 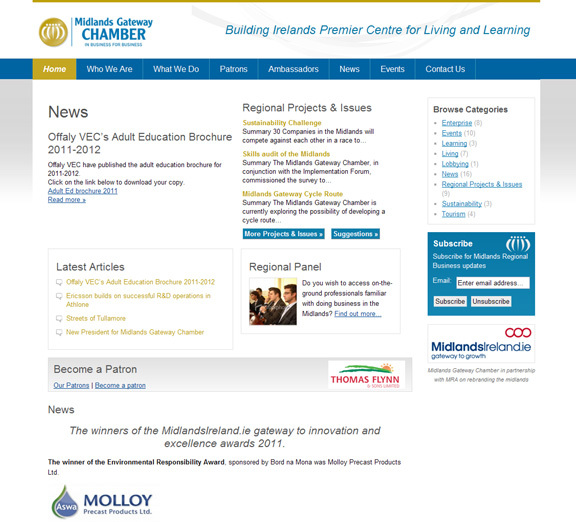 Representing Athlone,Tullamore and Mullingar as a single entity, the Midlands Gateway Chamber was formed in 2007 by forward thinking members of the town Chambers who recognized the need for one regional voice representing the midlands. To help promote that voice we’ve built them a great new website, packed full of information, be sure to check out their blog, we’re sure there will be something of interest in there for all.